Why risk life and limb searching the depths of a dark and dangerous dungeon for treasure when you can get a group of soda addicts to do it for you? 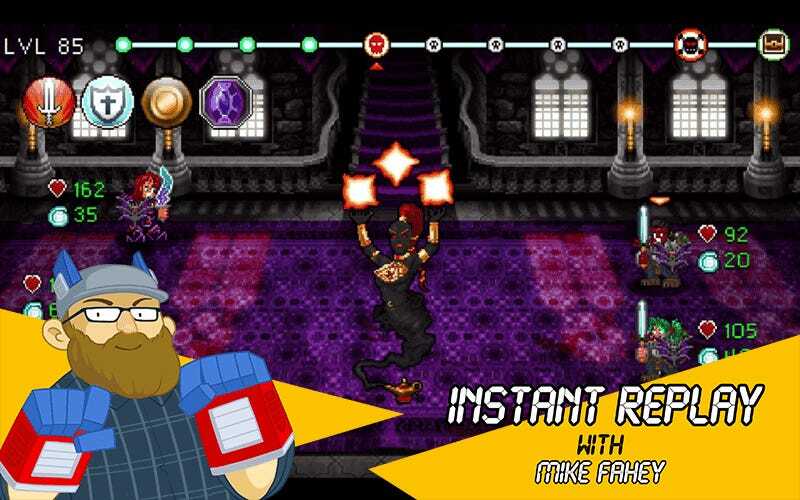 In Armor Games’ Soda Dungeon, out now for iTunes and coming in early November to Android, you play the part of a sort of dungeoneering party manager. Wandering penniless into a Soda Tavern and a dark and stormy night, you come across a caffeine-crazed thug who wants nothing more than to risk his life in a dungeon and bring you back the proceeds. A new business venture is born! The gathered gold is used to fix up the tavern and stock it with better and better sorts of soda, which in turn attracts more powerful adventurers capable of diving even deeper in the local dungeon. Soda Dungeon is a combination mild management/turn-based role-playing game. How much control the player has over their party depends on their personal preferences. One can let their party pick their own equipment and battle automatically through each dungeon level, or they can hand-pick every piece, building the perfect group and then controlling every combat move they make. It’s free-to-play game, but one of those free-to-play games that’s balanced squarely in the players’ favor. Ads rarely pop up and are quite brief, and there’s no pressing reason to spend real money on upgrades. That said, I’ve been enjoying myself so much that I plan on dropping a few dollars when I get the chance. Soda Dungeon is available for free download on iTunes. Look for it early next month for Android.